The Heart Nebula (IC 1805) and the Soul Nebula (IC 1848) are two giant molecular clouds located in the constellation of Cassiopeia. The two clouds are physically connected by a bridge of gas and reside in the Perseus arm of our Milky Way Galaxy. In the center of the Heart Nebula is the open cluster Melotte 15, which is one of many clusters formed from the molecular cloud. 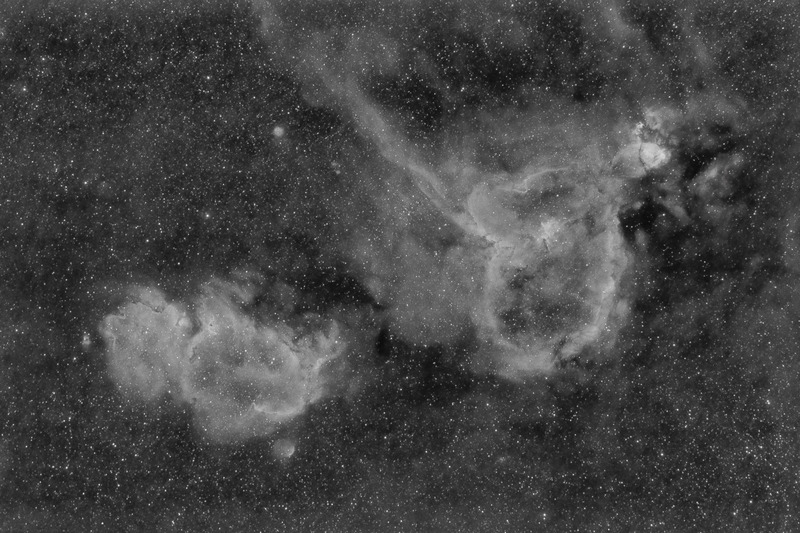 These clusters within the clouds are known as the Cas OB6 association, and the energy from their hot stars illuminate the surrounding nebulae. This photo was taken through a Hydrogen Alpha filter which allows a very narrow band of light through the filter. Software Used Images Plus 5.5 for camera control, calibration, stacking, digital development, smoothing and noise reduction, multiresolution sharpening, and star size and halo reduction. Photoshop CS5 used for levels and curves, high pass filter, star shrinking, screen mask invert, and unsharp mask. Gradient Xterminator for gradient removal. Registar for registration and stack alignment. Carboni Tools for additional noise reduction and smoothing. Focus Magic for focus restoration. Notes This Ha version of this beautiful region has some nice details - I'm pretty pleased with that as well as the nice extended nebulosity.